Today is a daily double for CFD-related birthdays. First, Pierre-Simon Laplace and now James Clark. James H. Clark was born 23 March 1944 in Plainview, Texas. If his name is still not familiar to you, maybe you know the name of the revolutionary company he founded in 1982, Silicon Graphics, Inc. Immediately prior to founding Silicon Graphics, Clark was a professor at Stanford University, where he was researching techniques for accelerating the display of three-dimensional (3D) images. While there he developed the Geometry Engine, a hardware accelerator for 3D imaging. Silicon Graphics’ first products, the IRIS 1000 series, were 3D graphics terminals that attached to a mainframe computer. The IRIS 2400, introduced in 1985, was a standalone, 3D graphics workstation. It made use of 3D graphics widespread in the CFD community. In particular, Silicon Graphics workstations made preprocessing and postprocessing of CFD solutions much easier and enabled people to begin solving problems they would not have previously considered. Early development of Gridgen was begun on a VAX mini-mainframe computer, but it quickly moved to Silicon Graphics workstations when their power became apparent. For many years, Silicon Graphics was the only hardware Gridgen ran on, until another Silicon Graphics development, OpenGL, led to 3D graphics becoming more common on many different hardware platforms. 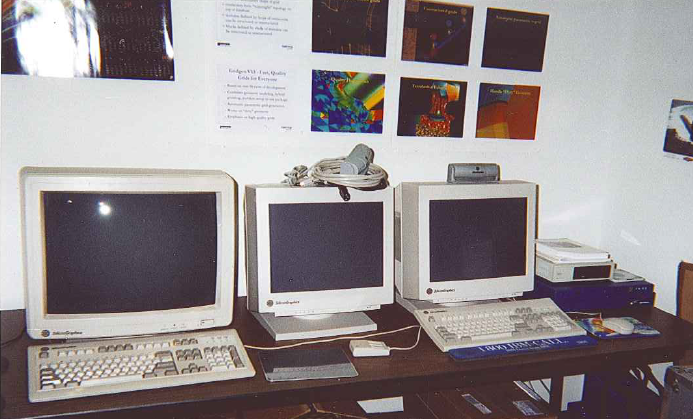 SGI workstations in an early Pointwise office. If you want to see an early Silicon Graphics workstation in action, watch this Gridgen video from 1988. Looks kind of primitive now, but it was exciting technology back then. If the video quality looks a little bad, this was made by pointing a video camera at the screen of the workstation. That’s how we did things back then. So the next time you are admiring colorful, 3D CFD images or interactively rotating a large 3D grid on your workstation, give a little thanks to Jim Clark. Silicon Graphics, Inc. company history. This entry was posted in Hardware, People & Places and tagged CFD, history, sgi, silicon graphics. Bookmark the permalink.